Dutiful governess Miss Caroline Robins could easily recognize the handwriting on the mysterious note. Her past is catching up and it’s returned to finish what was started ten years ago. Trapped in a loveless marriage, Moses Hayward, Duke of Barley, trudges the misty ground between propriety and his ever-growing attraction for his children’s governess. But not everything is as it seems, and Caroline is hiding a dark secret that threatens to leave them in shambles. She's been lying to them all. When Moses’ daughter is kidnapped, he is given an ultimatum: in order for Josephine not to die in a few hours’ time, Caroline must die in her stead. *If you like a realistic yet charming depiction of the Regency and Victorian era, then The Secret Life of the Elusive Governess is the novel for you. This is Hanna Hamilton's 20th book, a historical Regency romance novel of 80,000 words (around 400 pages). No cheating, no cliffhangers, and a sweet happily ever after. 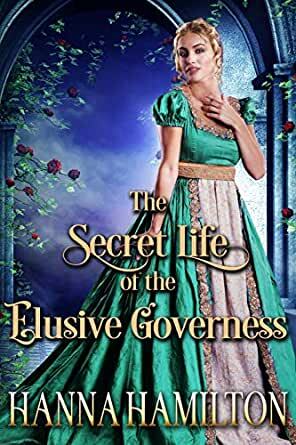 Pick up "The Secret Life of the Elusive Governess" today to discover Hanna's new amazing story!